Something called Time for Three blew into Cincinnati Wednesday night. Self-styled as the “world’s first classically trained garage band,” Zachary DePue, Nicolas Kendall and Ranaan Meyer, swept up an enthusiastic crowd at the School for Creative and Performing Arts’ Corbett Theater. Violinists DePue and Kendall and double bassist Meyer, Tf3 for short, were guest artists with the Cincinnati Chamber Orchestra led by music director Mischa Santora. It was their Cincinnati debut, and with everything from Edvard Grieg to Mumford and Sons, it made an auspicious opening for the CCO’s 40th anniversary season. Trained at Philadelphia’s Curtis Institute of Music and currently in residence with the Indianapolis Symphony, Tf3 adheres to Duke Ellington’s adage that “if it sounds good it is good.” They blend all kinds of music, including classics, bluegrass, country-western, gypsy, jazz-improvisation, you-name-it. It made for a one-of-a-kind-mix that sounded good, indeed. Case in point was Grieg’s Holberg Suite, a mash-up for Tf3 and the CCO, interlaced with Page and Plant, Lennon/McCartney, Coldplay and Tf3’s own “Banjo Love” and “Kissing in the Tree.” It was uncanny how the three did it (their instruments were amplified), cutting in and out completely in sync, in style, and with daunting technique (these guys have chops). Bassist Meyer, who spent much of his time in the upper reaches – literally -- of his instrument, kept his bow in a holster attached to the instrument’s tailpiece. There were gentle moments, as in the Sarabande, which cut away to “That’s the Way” and “Blackbird” before ending on fingered harmonics by violinists DePue and Kendall. “UFO” was another such moment, with aching solos by DePue and Meyer. Then it was off to the races in Grieg’s Rigaudon, which brought CCO principal violist Heidi Yenney to the front to join Tf3 in some arresting fiddling. 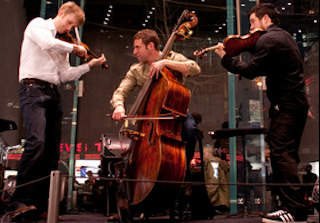 The trio closed the first half with “Czárdás” (by Vittorio Monti) in their own tongue-in-cheek arrangement. After a big CCO introduction, violinist Kendall obliged with a schmaltzy solo. The violinists burned up their fiddles in the Allegro vivace and there was a pause or two for some all-purpose hamming by all. Santora and the CCO kept in the spirit of things after intermission with Dances 1 and 3 of the Four Ragtime Dances by Charles Ives (a famous appropriator of vernacular music). As a kind of respite from all the commotion, this was followed by Samuel Barber’s well-loved Adagio for Strings, which Santora built from whisper-soft to an ennobling climax in one gleaming arc. The CCO welcomed Tf3 back to the stage with a chorus of glissandos and trills. Then it was mash-up time again with the orchestra. There was Justin Timberlake, Tim Mosley and Scott Spencer Storch (“Cry Me a River”), flavored with Barber and Antonio Vivaldi. They returned to gypsy with Johannes Brahms’ Hungarian Dance No. 5, which featured some amazing feats, such as Kendall bowing DePue’s violin while DePue played pizzicato (it takes two). Of course Beethoven had to be there, and he was in “Beethoven at the Gallows,” which blended the funeral march from his Symphony No. 2 with Led Zeppelin’s “Gallows Pole” about a man trying to escape the noose. Dramatic in concept, this one morphed into a virtual hoedown for the Tf3 players. Having worked their audience into a pitch of excitement, they kept going with their Meyer’s “Don Don,” a jazzy piece with a big bass beat, including much slapping of the fingerboard. They closed with “Little Lion Man” (Mumford and Sons) in which Kendall strummed his violin like a banjo. The pace, as it was all evening, was exhilarating, exuberant and ultimately irresistible. Their encore was, what else, “Orange Blossom Special,” with a little bit of Johann Sebastian Bach thrown in.